Choosing a strong lead story sets up a newscast for success and keeps viewers watching. Flowers are set aside next to a memorial for the victims of the Pittsburgh shooting. 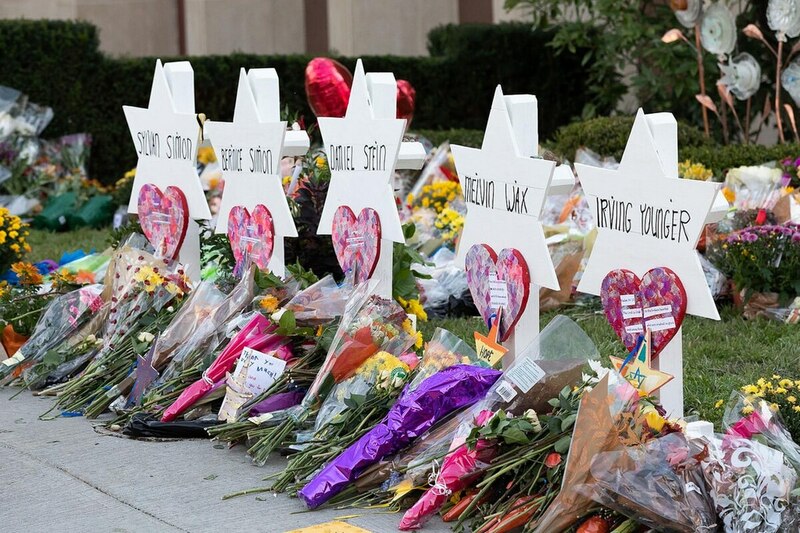 A community forum at USC Hillel to discuss the shooting was the lead story of this week's Tuesday newscast. Photo courtesy of The White House. When viewers tune into a show, they want to be impressed. When flipping through channels, the first few seconds, the first impression, has the power to dictate whether a viewer will stay glued to the content or leave for other channels. Obviously, as a producer you want your entire show to be as strong as possible so as to leave a great impression on the viewer. However it is imperative that a show start off strong so viewers can learn about the most pressing news of the day, and feel the content is compelling enough to stick around for the ensuing portions of the show. Hence, the value of the lead story is paramount, for it sets the tone of a newscast's coverage throughout. In the context of being a lead producer in the Annenberg Media Center, the process of learning how to select a lead and why certain stories work better than others is definitely something I have had to learn throughout this semester. For me, I think about what the viewer of Annenberg TV News (ATVN) would want to see. Since our target audience is USC students or college students in general, if there is a big story related to USC I want to hit that right away, such as an update to the case of former Engemann gynecologist George Tyndall or a pubic forum about the search for a new university president. If there is no such story, I look for something in Los Angeles that might interest a young viewer. From marches downtown against rent, immigrant rights, or healthcare to a new policy the mayor is pushing out, if it is something incredibly important for the viewer it could be worthy of being the lead. In this week's Tuesday edition of ATVN, however, there was another type of story that took the lead: a national story with a local angle. The tragic shooting in Pittsburgh over the weekend is still being felt across the country, and the news hit home for many students in the USC community. I thought this was the most important story of the day because of the scope and how prevalent it was in the news cycle. But what made our coverage unique is that we localized it for USC students – showing what USC Interim President Wanda Austin is doing about it, going live outside USC Hillel where a forum on safety was happening, and updating viewers about safe spaces on campus. I thought that this was a captivating lead that drew viewers in, especially given our live reporter being at Hillel and having an exclusive interview with Interim President Austin, setting up the rest of the newscast nicely. When selecting the lead story as the lead producer, I try to make sure it is a story the whole team can get behind. Sometimes I will consult with Sofia, my executive producer, about what I want the lead to be to see if she has any thoughts, but other times the lead comes quicker, and we are on the same page. In the process of assigning a cold open, a short video or sound that airs right before the lead story with no anchor introducing it, I make sure to tell the multimedia journalist editing it about the significance of a cold open to the show. This way the multimedia journalist can feel more empowered by their own work, and the sense of communication and teamwork continues. I do feel like I naturally am checking with a reporter or multimedia journalist working on the lead story more than other colleagues, because of the importance of their story. Ultimately, I want to make our shows as best as they can be, and having a strong lead story is a great first way to do this.